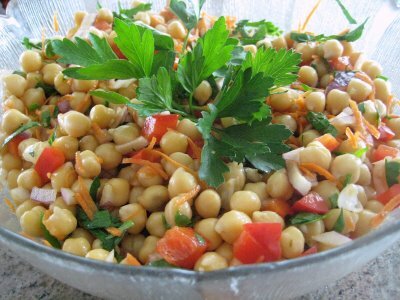 A fun twist on tabbouleh, this Lebanese chopped salad with chickpeas (Salata Hommos) is bursting with fresh flavors and packed with protein. Take the chick peas out of the water and quickly plunge them in salted boiling water. When it starts boiling again, take them out, rinse them with cold water, pout them in a clean towel and gently rub them to remove the skins. Rinse again in cold water in a bowl: the skins float and flow away with the water. Season with lemon and oil. Offer the pounded garlic and the mint on the side so that everyone can add it according to their own taste. Serve fresh.